Chances are good that your acting resume will only get a couple seconds worth of attention from a casting agent or director, so it's important to make a good impression quickly. Highlight your experience and training while also presenting the information in an easy-to-read format. 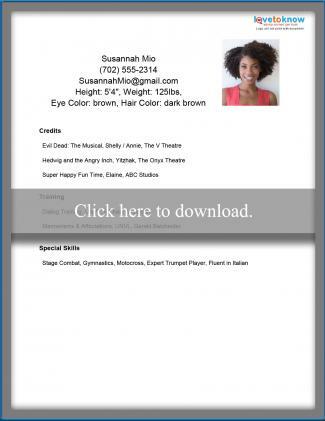 Use one of the templates provided below to get started in pulling together your acting resume. The template on the left is for a one-sided resume; it should include a small version of your headshot in the upper corner. The other printable is for a two-sided resume with a full headshot on the back. Click the image of the style you prefer to download. If you need help downloading the templates, check out these helpful tips. Like other resumes, acting resumes highlight your experience and training. Acting resumes do need a particular format, however, otherwise you risk having your resume tossed out before it's reviewed. You may think that your audition can outshine a poorly formatted resume, but you might not ever get to the audition if your resume isn't right. Start with your name and contact information. If you have agency representation, use their contact information. Include any affiliations you have. This is where you would include a membership within SAG-AFTRA, for example. The section describing your height, weight, hair color and eye color needs to be current. Categorize your acting credits by stage, screen and television, listing them in order of importance as opposed to chronologically. If you don't have much experience, list everything without breaking your acting credits into categories. List your training, such as acting classes and workshops you have completed. Finish your resume with a list of your special skills. These should be specific to the role for which you're auditioning and may include things like languages spoken, musical abilities, etc. Limit the resume text to one page. Include a professional headshot, either in the corner of your resume or a full 8x10 on the back. Your headshot should look like you actually look. Never include information that isn't true. 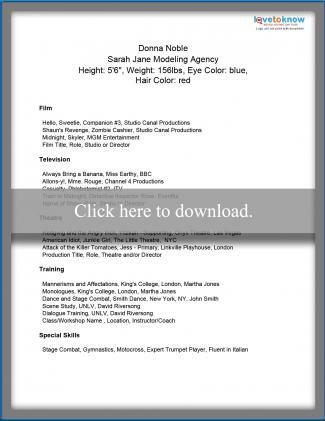 Customize the resume for each acting gig, if possible. Use font that is easy to read. Do not use colorful text or paper. Whether you're auditioning for a role or seeking agency representation, a well-formatted resume may be what helps you get your foot in the door. Update your resume frequently since you never know when you might get your next big break.